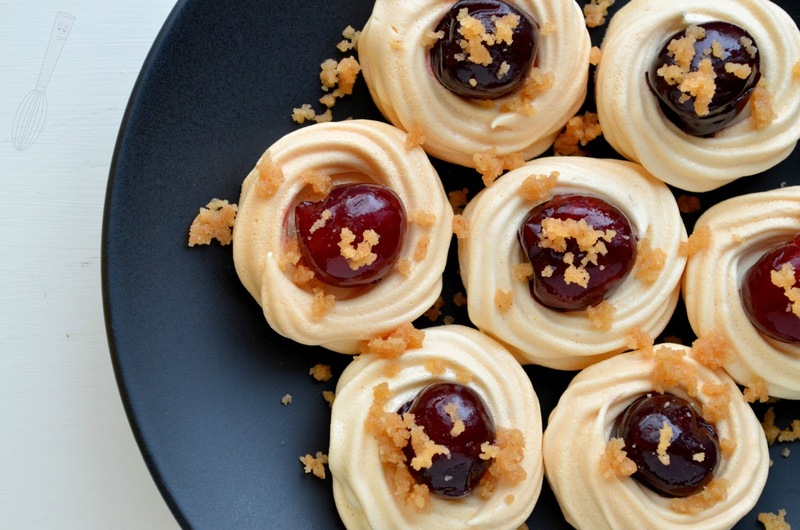 To some people meringues are like little cardboard cookies but to other people they are like little clouds of delight. 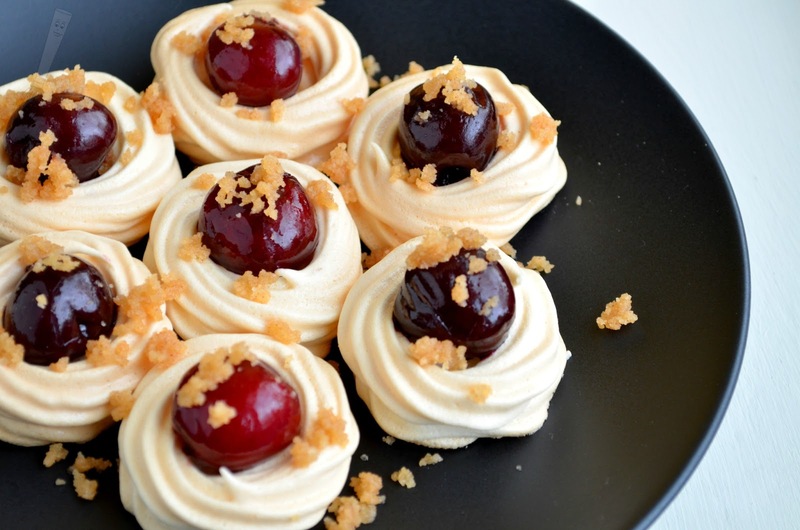 I fall into the latter group because when meringues are made well then they are crunchy on the outside, soft on the inside, and melt in your mouth when you eat them. 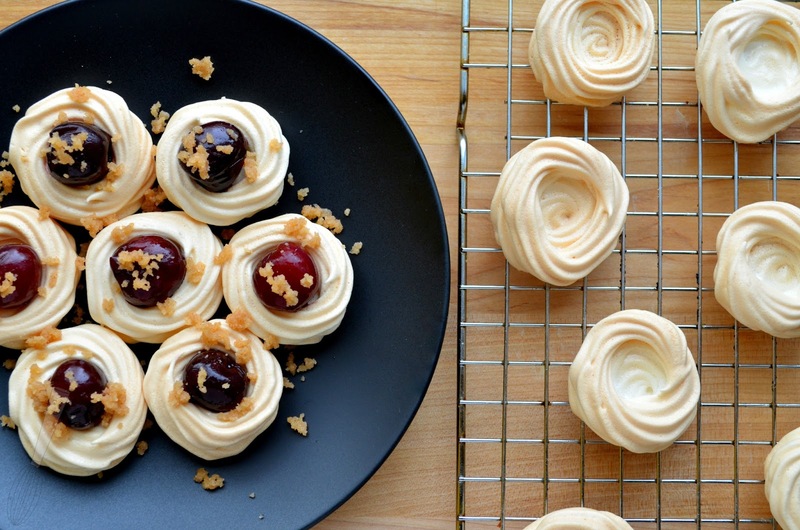 One selling point of meringues is that they are typically fat free becaue they're just egg whites and sugar (and a few other small ingredients sometimes). These little pillows of delight are perfect for a dessert tray and easy to make the parts of the recipe ahead so assembly takes mere minutes before serving. I've been trying to make healthier desserts recently, and will attempt to continue on that trend. I have no shortage of people willing to try the treats I prepare but none of them live close. Therefore, most of the time the entire yield usually is consumed by my husband and I, and my son when he likes whatever it is. I was thinking about meringues because they are so light and fluffy on the inside and crispy on the outside and I was brainstorming ideas for flavors. I thought turning them into the flavor of cherry cobbler may be fun and I'm so excited that I was right. The sprinkle of streusel really helps to bring out a cobbler flavor in combination with the cherry. Fresh cherries would be best I'm sure for flavor purposes but you can use frozen cherries that have been thawed as well (I did). Meringues in general have so many different recipes that they work in and can provide so many different flavor combinations. If the little meringue bowls are made ahead of time these may also be a fun dessert that kids can help "make" because they could be filled with any kind of fresh fruit and even topped with a bit of whipped cream for a nice dessert. 1. Preheat oven to 250F. In the bowl of a mixer, whip the egg whites until they are frothy in appearance. Add in the cream of tartar and whip until soft peaks are formed. Add in the powdered sugar, 2 tablespoons at a time, mixing in between additions. Whip the egg whites to stiff peaks. 2. Using a piping bag with a star tip (or a zip-top bag) pipe about 20 2” rounds of meringue in the shape of little bowls. Bake for 55-60 minutes or until lightly browned on the outside. Remove from oven and set aside to cool. 3. Turn the oven temperature up to 350F. 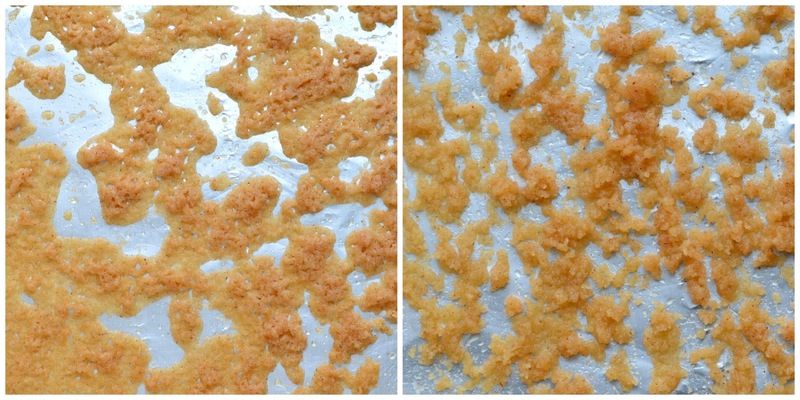 In a small bowl mix together the flour, granulated sugar, butter, and cinnamon until it’s about the size of peas. Spread it out on a small sheet pan and bake for 9-10 minutes or until golden brown. As soon as it is out of the oven break it up using a rubber spatula so that when it cools it will be in smaller pieces. Let cool completely and it will crisp up a little as it cools. 4. Assemble: Place on cherry in the middle of each egg white bowl and sprinkle with the streusel topping. Serve immediately. *Note: The cherries can be room temperature or warm when served. Thank you! I think the flavor combination works well together. Thanks! I will check out your site. These are adorable & a great idea! I would love it if you would come share this & any other recipes you may have over at my Sweet & Savory Saturday's Link Party. It ends Monday at midnight.